They spilled their guts on the track with two of the best performances in meet history on Friday night. So it wasn’t really fair to expect Chris FitzSimons and Joe Rosa to top it. But they very well may have. Rosa, the 2-mile champion in a national junior class and NJ state record on Friday in 8:44.06, and FitzSimons, who split 1:47.15 on the winning 4x800 on Friday, once again came up with jaw-dropping races that had the fans falling out of their seats. 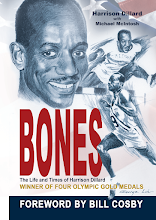 It happened in the eagerly anticipated Distance Medley relay. Rosa, a junior from West Windsor-Plainsboro North, NJ, led off for his team and went head-to-head with sophomore stud Zavon Watkins of Liverpool NY (1:47.99 in the 4x800) on the leadoff leg. It looked like Watkins was going to get away from Rosa with 200 to go on the opening leg, but Rosa fought back and handed off in the lead with a mind-boggling split of 2:59.56. Watkins was right on his heels with a 3:00.01. Rosa’s split is the second fastest ever recorded by a high school runner and Watkins is No. 3. Only Steve Magness of Klein Oak High in Houston, Texas (2:56.8 in 2003), has run a faster 1,200 leg than Rosa and Watkins. After Jim Rosa, Joe’s twin, retook the lead on the anchor leg for West Windsor North, it was FitzSimons’ turn to light up the track. Sitting in sixth place when he got the stick, FitzSimons, a senior, pounded out a 4:05.70 anchor and powered by Rosa with 200 to go and went on to give Hamden of Connecticut the win in a US #6 all time 9:56.50. Warwick NY was second in US #12 all-time 9:59.03 and West Windsor North was third for the second straight year in a US #13 all-time 9:59.07. 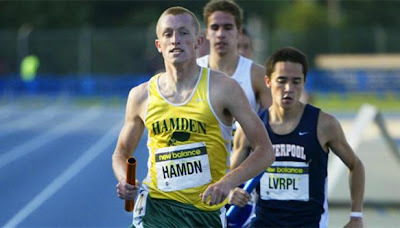 Hamden also won the DMR at the Nike Indoor Nationals. FitzSimons said he felt the 800 in his legs from the day before, but wasn’t about to give in to the pain. "The lactic acid started building up, but I saw I was getting closer to him (Rosa) and I owed it to my team to do everything I could to win," said FitzSimons. FitzSimons said he had no idea which Rosa he was chasing, but it didn’t matter. "I know how great the Rosa’s are," said the Villanova-bound FitzSimons. "I didn’t know which one it was, but it didn’t make a difference because they are both animals and I knew I’d have to run real fast to have a chance to beat either one of them." "Chris deserves all the praise and all the credit," said Nick Saba. "We just keep handing off the baton until Chris gets it and he pulls out the win for us." "When I heard I had a four second lead I thought that would be enough," said Jim Rosa. "But I underestimated him. That guy is amazing." Joe Rosa was ecstatic with what he and his teammates did this weekend. "I couldn’t be happier," said Rosa, who also ran a 4:08.65 mile last week.